Winter crop production is forecast to decrease by 23pc in 2018–19 to 29.3 million tonnes (Mt). Forecast winter crop production is 20pc below the 20-year average to 2017–18 but 69pc above the lowest production during this period. 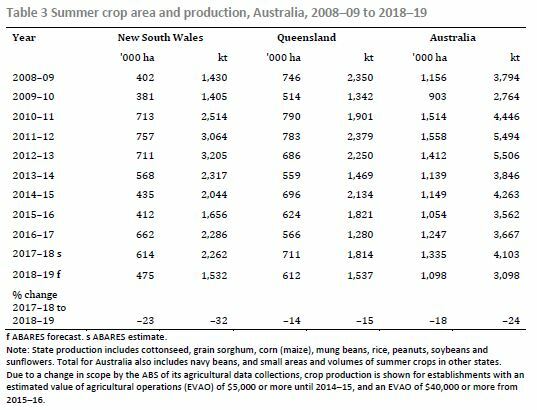 Winter crop production in Western Australia is expected to account for 56pc of national production in 2018–19, compared with an average of 36pc in the 20 years to 2017–18. November to date rainfall has been generally average across summer cropping regions in northern New South Wales and Queensland. 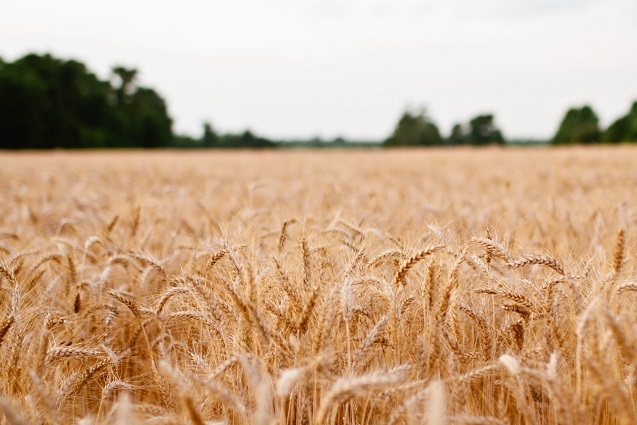 Prospects for summer crops will be highly dependent on sufficient and timely rainfall because of low levels of soil moisture in a number of regions. 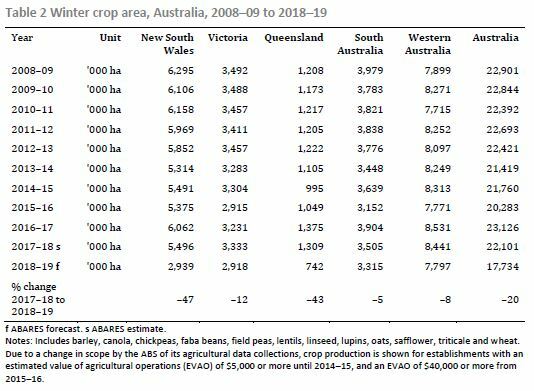 NATIONAL winter crop production is forecast to be 20 per cent below the 20-year average, coming in at 29.3 million tonnes (Mt) for 2018–19, according to the latest Crop Report from the Australian Bureau of Agricultural and Resource Economics and Sciences (ABARES). ABARES executive director, Dr Steve Hatfield-Dodds, said Australian winter crop prospects deteriorated in early spring because of unfavourable seasonal conditions in most cropping regions. 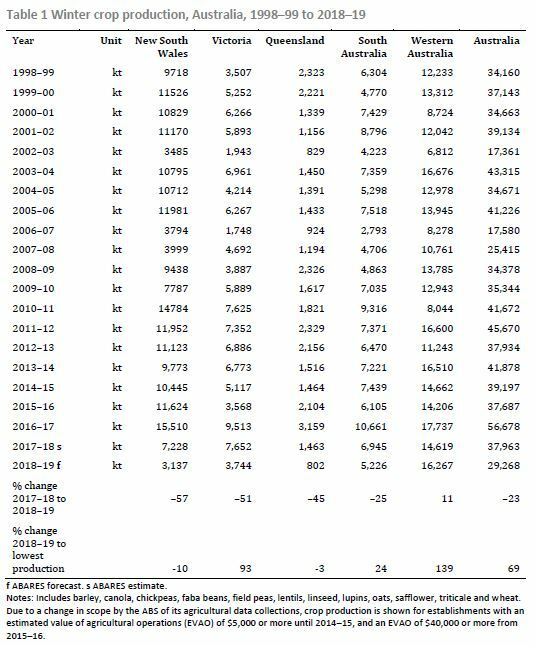 “While production in New South Wales and Queensland is forecast to be the lowest in over 20 years, we expect national production to be substantially higher than in the droughts of 2002-03 and 2006-07,” Dr Hatfield-Dodds said. “Above average rainfall in October benefitted crop prospects in southern New South Wales, southern Wimmera in Victoria, southern South Australia and Western Australia. However, it arrived too late in other regions to benefit winter crops. “Western Australia is expected to account for 56 per cent of national winter crop production in 2018–19, compared with an average of 36 per cent in the 20 years to 2017–18. “Summer crop planting in Queensland and northern New South Wales increased following favourable late spring rainfall,” Dr Hatfield-Dodds said. “The Bureau of Meteorology have indicated there is no strong tendency toward either above or below average summer rainfall in cropping regions in New South Wales, and summer rainfall in Queensland is more likely to be below average than above average.